Days 10, 11, 12 I thought this bedroom would be easy because I knew I dare not remove any of our daughter’s memorabilia. It hasn’t really been her bedroom since she graduated from college, almost 20 years ago, BUT she had personalized it by painting murals and sayings on the walls. Besides, anyone who hangs 26 paper cranes from a ceiling by definition is particular about her belongings. Good, I didn’t plan on going through any of her stuff. It only took about 15 minutes to assess if anything was really extraneous. I relocated about 10 empty frames and a tool box. So, why spend 3 days here? Because one thing leads to another, and other family member’s stuff was stored in this room. • Taxes: Our accountant said we only need to store tax returns for 7 years. We had tax receipts from 1987-2009. I’ll shred these but it did free up 51 paper clips. We refilled the box with 2011-2018 information. 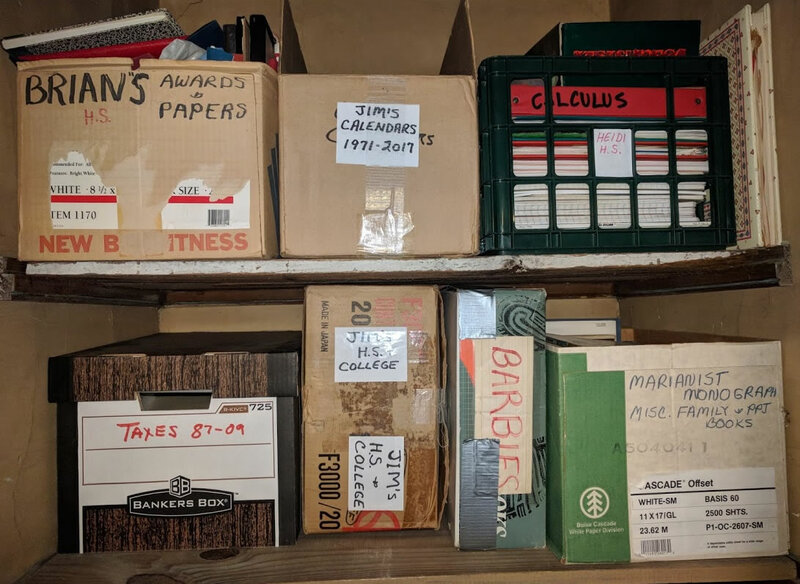 • Calendars: Jim has saved calendars from 1964-2018 (that’s 54 years). Perhaps his biographer will want these when he becomes famous 🙂. Since I don’t control his giveaways, I merely reorganized them to fit better. • Barbies: We keep these for visiting kids. Maybe they’ll be worth something some day. • HS & College papers: I think most of these can be pitched but they’re not mine and they’re not hurting anything in the closet so I’m leaving them for our grown kids to determine their fate when they visit at Christmas. File cabinets: My husband loves geography. One file cabinet holds mostly maps organized by state and country. No harm in keeping them and pruning them would be a marital mistake. The other file cabinet held historical files from his tenure on our local school board. It’s not mine. Let it be. It also held back newsletters from Parenting for Peace & Justice. Jim was on staff for PPJ but we both were involved, so I felt I had standing to review these. I saved one copy of each issue from 1981-1999. Anyone want to read some interesting articles from 20 years ago? Days 13, 14 By the time I got to our last guest bedroom I was tired of sorting through other people’s memorabilia, so I reorganized some stuff, will give away some little children’s toys. I did, however, find 12 old T-shirts that my husband had collected from bike-a-thons. He agreed to let me pass on half. 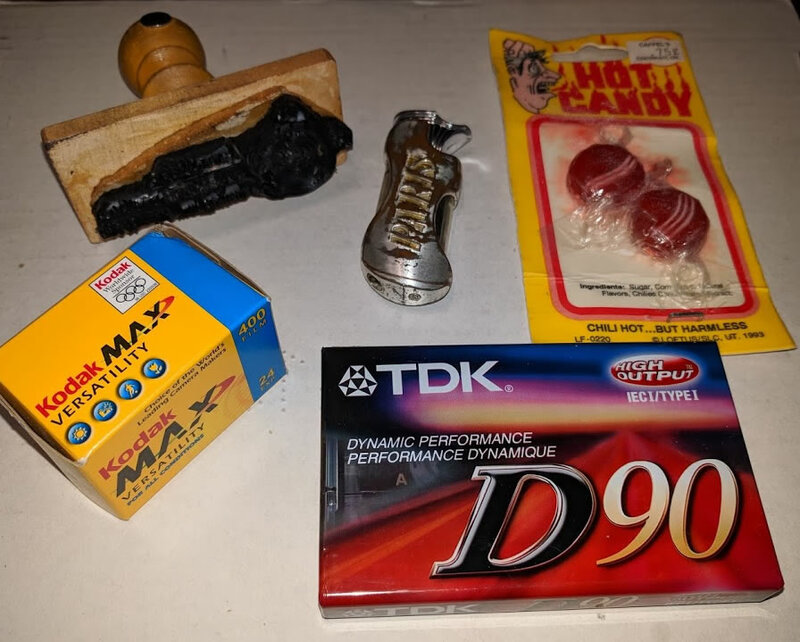 I did find 5 totally useless objects: unopened cassette tape and roll of Kodak camera film, deteriorating candy, broken lighter, and obsolete stamp. Days 15, 16 The upstairs bathroom may be the smallest room in our house but I knew it would take a lot of time, so I “stole” a bedroom day. The cabinets over and under the sink only took about 30 minutes but the linen closet was almost an all day affair since it included all kinds of medicines and other health related equipment. 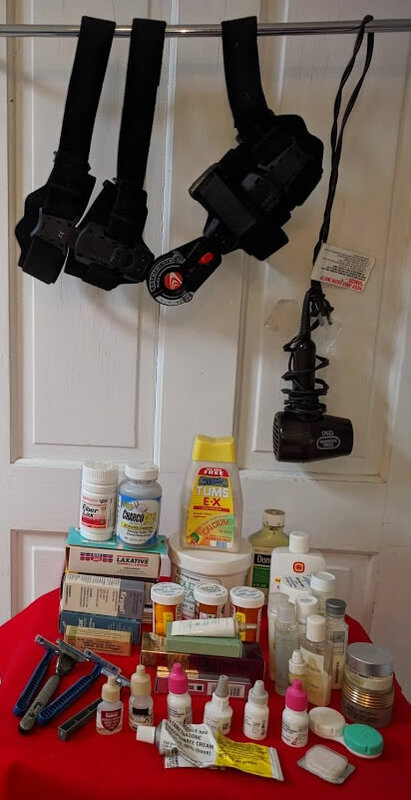 • Brace from when I broke my arm. I hope to not need it again. • Hairdryer: One useful find was an extra hairdryer to give away. • Medications: I found 31 expired medications of which 8 expired over 20 years ago and many were no longer needed. For example, our kids are way past needing acne medications. Although not all expired medications are unsafe or ineffective, I decided to safely dispose of most of them. • Useful Tip-Razors: What do you do with 4 extra disposable razors? Gillette is partnering with Terracycle to offer free recycling. Finally, I’ve finished the upstairs! #1 | Written by Jim Veihdeffer about 4 weeks ago. I call -collusion-between this “Brian” and “Barbie,” whose respective boxes seem disproportionately represented in their areas.